I read a lot about tenkara rods for trout, and carp rods for carp, but not much is said about tenkara or keiryu rods for catfish. That’s understandable. Tenkara rods were originally designed for mountain stream fishing in Japan, which is hardly the spot for bottom-hugging catfish. But, as tenkara and keiryu fishing is adopted and adapted to the States, catfishing becomes a natural, rewarding part of our sport. Catfish can grow to enormous sizes. For example the Texas state record channel catfish is over 36 pounds. Yellow cats and blue cats are bigger yet. But the majority of channel catfish caught in creeks, streams, and rivers, average one-three pounds. 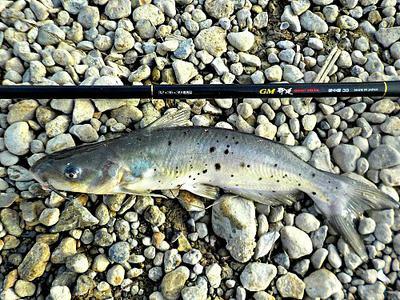 If you do hook a three-pound cat with a tenkara rod, you’re in for a serious tussle. 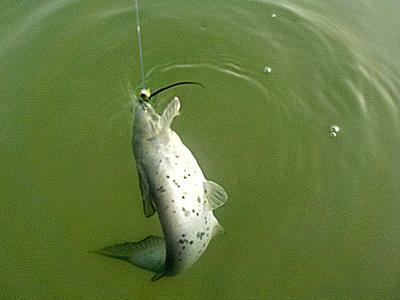 Catfish pull straight down, and their flattened bodies and tenacious attitude make them great fighters. No, you won’t have the dramatic leaps and slashing runs of a bass or a trout, but you will wonder if that fish is ever going to rise from the bottom. They resist the pull of a rod with determination. You need plenty of leverage and lots of patience to raise a decent-sized cat. The average channel cat may not be as big as the average carp, so what does that mean when it comes to tenkara and keiryu rods? If you have trout and panfish rods on one end of the spectrum, and two-handed carp rods on the other, then channel catfish rods would fit somewhere in the middle. A pole like the Suntech Field Master 39 is a good example. It has enough backbone for the average catfish, while still being supple enough for lighter, smaller fish. The Suntech GM Keiryu Special 39 is another great channel cat rod. If you’re pursuing bigger catfish, then you would have to go with something like a carp rod. I would sum up by saying that the ideal catfish rod will have enough length to reach the deeper holes, enough stiffness to handle beadhead nymphs or live bait, enough backbone to land a good-sized fish, yet still be sensitive enough to catch the smaller fish you’ll likely encounter. It’s a tall order, but Chris Stewart carries some rods, like the Field Master, that are just made for it. Whatever rod you use, be sure to couple it with extra-sharp hooks. 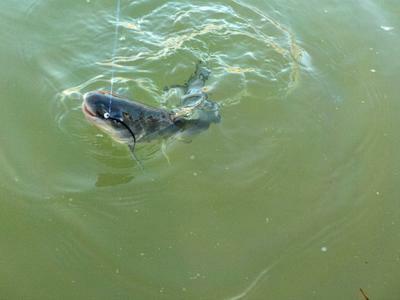 Catfish have tough mouths, and it can be hard to get a good hook set with a soft pole in deeper water. Any of the better-quality brand name hooks work well; and the good news is, once that hook is driven into the catfish’s tough mouth, it’s probably not coming out! Robin and I often catch catfish on beadhead nymphs bounced along the bottom, but they really are made for keiryu-style fishing, using nightcrawlers, crickets, butterworms, or mummy worms for bait. Because channel cats are plentiful throughout the drainages we fish in the Edwards Plateau Region of Central Texas, our catfish poles often end up being whatever tenkara or keiryu rod we happen to be using. You really haven’t lived until you you’ve been bluegill fishing with your Suntech Kurenai 30 and a channel cat swallows your fly! Or maybe check out the photo above of a nice channel cat that I landed on a Nissin Honyru 330. Better hang on and hope that you have light enough tippet to protect your rod! Mostly we fish where we live, and in the South, that includes catfish. Yes, I know that channel cats would not fit the purist’s definition of tenkara fishing, and some people consider them “trash fish,” but why refuse such wonderful sport? These fish have a unique appeal and their own special fighting ability that will test your skills and equipment to the limit. Nice write-up on pursuing cats. They're one of my best options here in Kansas, along with wipers and bass. Sounds like you have better luck with getting them to take a fly than I do. Channel cats are pretty good about taking flies, if the water conditions are right. Still, they have a strong sense of smell, and live or preserved baits often work better. Many of our area rivers are stocked several times a year, and the young stocker cats are more eager to pounce the artificial nymphs. The new Mummy worms that Chris offers also seem to work well. I'll have to try the nymphs out in the spring. Most of mine have come on streamers incidental to wipers. I do occasionally see some 30"+ catfish actively feeding on shad in the rapids. I've got some patterns that I know they'll eat, but I need to save up for one of Chris' carp rods if I hope to stand a chance. I caught one catfish last year. I was using a red wiggler, and was fishing for smallmouth bass. There was a nice deep hole and I added a couple split shot to check out what might be down there. The Suntech Keiryu Sawanobori 63 handled the 3 pounder just fine. Once I got him off the bottom he headed for a downed tree and I got him turned. His last attempt to get off was he took a run up the gravel rapids and I was able to turn him into the pool and land him. I think catfish are really fun to fight! It is just a different kind of fight. In my research I have found that the Snake River near where I live is suppose to be excellent for catfishing, and I am already planning on fishing for them specifically this spring. When I do, I will probably be using my Nissin Kyogi 6.4 meters. The Snake is a big river.